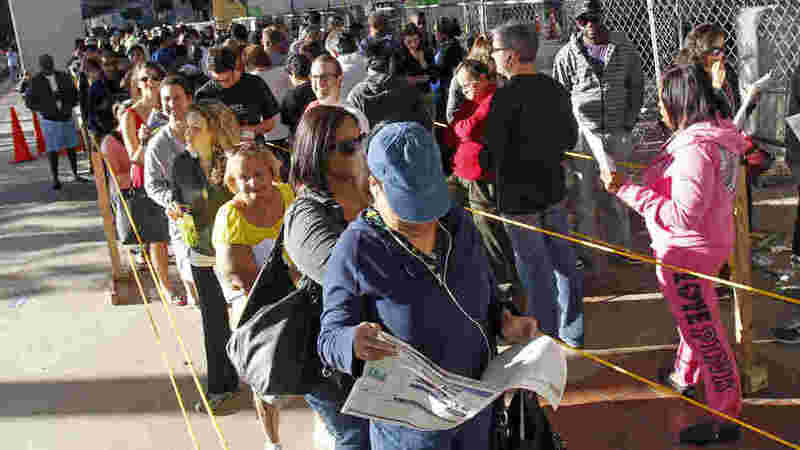 Floridians stand in line during the last day of early voting in Miami on Saturday. A judge extended early-voting hours in one Florida county Sunday after Democrats sued to allow more time. Early voting ended in Florida on Saturday. But on Sunday, some county elections officials opened their offices to allow people to vote using absentee ballots. In Miami-Dade County, elections officials opened the office for over-the-counter absentee voting, but then inexplicably shut down. A couple of hundred waiting voters began chanting and pounding on the doors. An hour later, the office reopened. On Monday, Miami-Dade Elections Supervisor Penelope Townsley said the problem was that Miami-Dade Mayor Carlos Gimenez, a Republican serving in a nonpartisan post, hadn't approved the absentee voting. "At the same time, we were experiencing operational difficulties, including not enough resources. Once the mayor was briefed, he authorized that we continue," Townsley said. By operational difficulties, Townsley is referring to the huge number of voters who showed up, overwhelming her small staff and ballot printing machines. Florida's Republican Gov. Rick Scott signed legislation earlier this year that imposed new restrictions on voting, many of which were overturned by the courts. One provision that remained in place reduced the days for early voting from 14 to eight. That led to long lines at early polling stations across the state last week, and some waits of four or more hours. Early voting was very important to Florida Democrats in 2008, when a strong early-vote turnout helped Barack Obama carry the state. Last week, a series of Democrats sent letters to Scott asking him to add days for early voting. He refused, so Democrats went to court. That's when county elections officials who were named in the lawsuit decided to allow in-person absentee voting. At the Miami-Dade elections office on Monday, it was a scene disturbingly reminiscent of Florida's disputed 2000 presidential election. A couple of hundred people waited in line to cast absentee ballots, but there were also hordes of reporters and TV trucks, along with officials and party activists holding competing news conferences. Los Angeles Mayor Antonio Villaraigosa was also there, on behalf of the Obama campaign. He said encouraging people to vote was something upon which Republicans and Democrats should be able to agree. "Unfortunately, that's not what we're seeing here in Florida and other states where you see a concerted effort on the part of the Republicans, in this case on the part of Gov. Rick Scott, to discourage voting, to make it difficult for people to vote," Villaraigosa said. In Tampa on Monday, it was Florida's former Republican Gov. Charlie Crist â" now an independent â" speaking out on behalf of the Obama campaign and encouraging people to cast last-minute absentee ballots. Florida's Republican Party hasn't challenged the move by elections supervisors to allow last-minute voting by absentee ballots. But clearly, some Republicans aren't happy about it. "I think you're starting to see some nefarious actions already coming from the other side because there's been an incredible turnout from Republican voters on the early voting down here in Florida," Florida GOP Rep. Allen West told Fox News. Miami-Dade elections officials say they expect more lines when the polls open Tuesday, but they say they're ready.